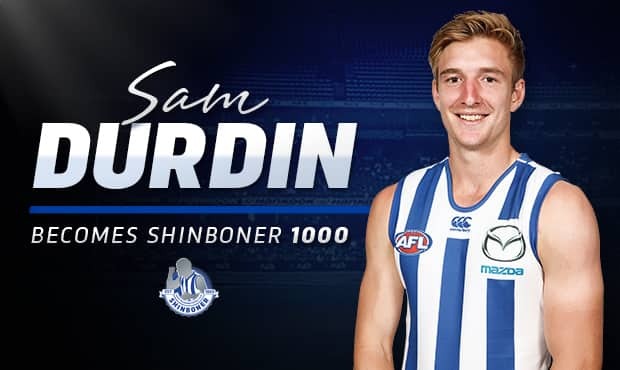 Key defender Sam Durdin will become the 1000th Shinboner when he makes his North Melbourne debut in Hobart against Greater Western Sydney on Saturday. The 2014 first-round pick replaces suspended backman Scott Thompson as the Roos prepare to take on Giants stars Jeremy Cameron and Jonathon Patton. Durdin's teammates greeted his selection with warm approval, minutes after coach Brad Scott revealed the news to reporters. The 198cm key-position player battled shoulder and foot injuries in 2015 before spending last season at VFL level, but impressed in this year's JLT Community Series. "From day one of the off-season last year, he's been determined to break through into our senior team," Scott said of Durdin. "He's had a magnificent pre-season, played some good pre-season footy, and it's a great honour to be the 1000th Shinboner to represent our club. "We're really excited for Sam and you guys are hearing about this before he's heard about it, so he'll be excited."